The Kremlin is not a place to cut across the well manicured lawns, unless you wish to be scolded by the security. The Cathedral of Christ the Savior was consecrated in 1883 but would be destroyed in 1931 to make way for a proposed Palace of Soviets. That never happened, so the Cathedral was rebuilt and opened again in 2000 at a cost of $360 million. When a group of photography friends planned a trip to Moscow, I was down for the adventure. I like to think I travel without any pre-conceived notions of my destinations, armed only with an insatiable curiosity. But somewhere in the back of my mind was lurking this idea that Moscow would be a colorless city composed of stoic industrial-like buildings. I envisioned seeing babushkas wearing aprons with a scarf tied around their heads carrying a bag of potatoes. I was prepared to see downtrodden citizens milling about. Imagine my surprise when I arrived at the elegant Radisson Royal Hotel (my home for a few days) to see a Rolls Royce dealer at one end of the lobby. Sophisticated men and women were mingling about. I’m talking gorgeous women – beautifully decked out in short dresses and killer high heels. Men in tailored suits. The parking lot was full of luxury cars – Ferraris, Rolls, and Mercedes. Moscow was going to be full of surprises. 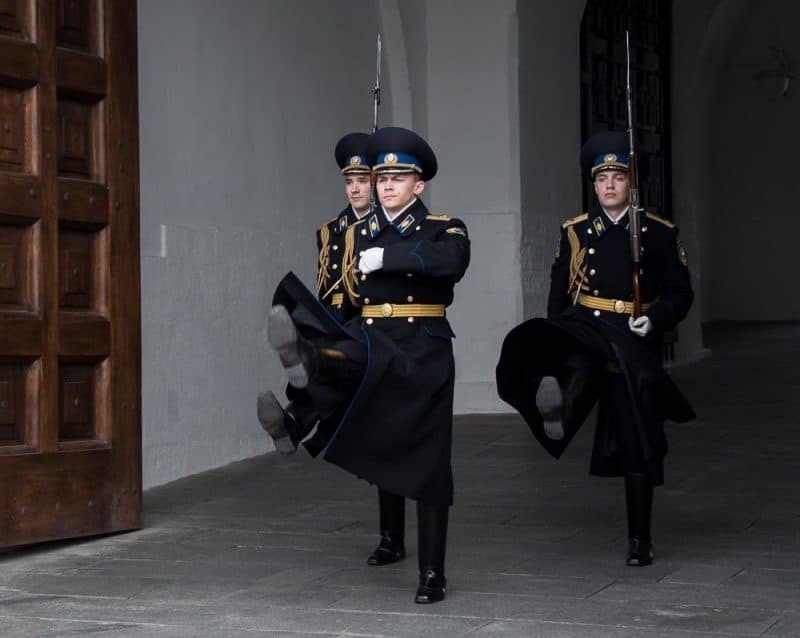 These somber faced goose-stepping guards change every hour at the Kremlin. I believe this might be the first country I’ve visited where English was nowhere. Typically in airports, train stations, street signs, etc. you generally see English translations to help out foreigners. But not in Moscow. Their funky Cyrillic script was unreadable to me. I couldn’t sound out anything! If English is taught as a second language, then locals weren’t fessing up. I asked directions numerous times and all I got was a shrug of the shoulders. The moral of this story is don’t count on help with the English language in Moscow. Moscow definitely needs to step up their customer service, or at least be taught what it is to smile. People seemed unfriendly, unhappy and grumpy. You would think at the major tourist attractions you would find a friendly face, but not so. 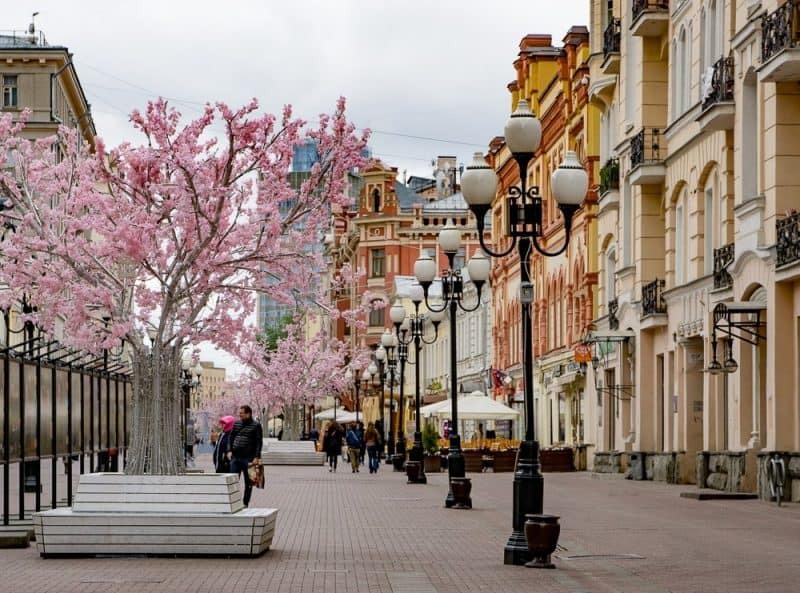 The most famous street in Moscow is Old Arbat, once the hangout of nobility, poets, and artists. It was turned into a pedestrian street in the 1980s, and today is a popular tourist attraction. Even within the hotel, between the front desk staff and the security guards, it was matter-of-fact treatment sans smiles. There was no chit chat to be had, and in fact, when I wanted to take a few photos in the lobby, a guard came up and wiggled a no-no with his finger. Seriously, folks – it’s a lobby, get over it. So much for the “bad” side of Moscow. There is plenty of “good” that begs to be explored in this sprawling city, Europe’s largest with around 13 million people. Remarkable architecture and monuments abound, many of which are lit up at dusk like Christmas trees. Moscow is not a quaint, walkable city by any means. To be most efficient with our time, we hired a very knowledgeable guide, Alexandra, who helped us negotiate the hustle and bustle of the city while feeding us with engaging tidbits about her country. 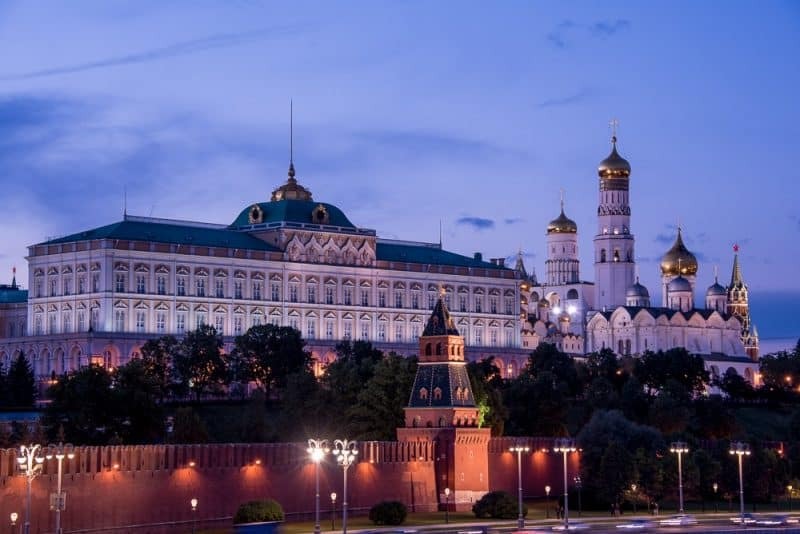 Topping the list of Moscow attractions has to be the Kremlin, the world’s largest medieval fortress surrounded by a massive wall with intermittent towers. The Kremlin, shown here at dusk, is a remarkable complex of churches, palaces and monuments and includes the world’s largest bell and canon. 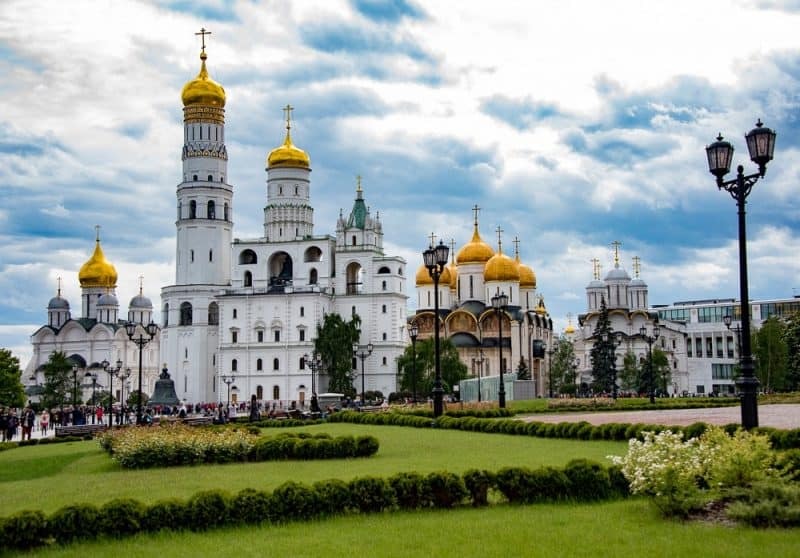 The Kremlin is home to the world’s largest bell and cannon, as well as the official residence of the Russian President. Putin was nowhere to be seen. While photography isn’t allowed inside the five palaces and four cathedrals within the Kremlin walls, the gorgeous exteriors provided ample opportunities for shooting. The onion shaped domes on the tops of the churches are stunning. Alexandra offered two sketchy theories as to how these beautiful domes came to be. She said they were designed to allow snow to easily slide off in the harsh winters, but she had also been told they were meant to resemble a lit candle. I suspected there must be a deeper significance to these beauties, but for now, I was content to just take the pictures. 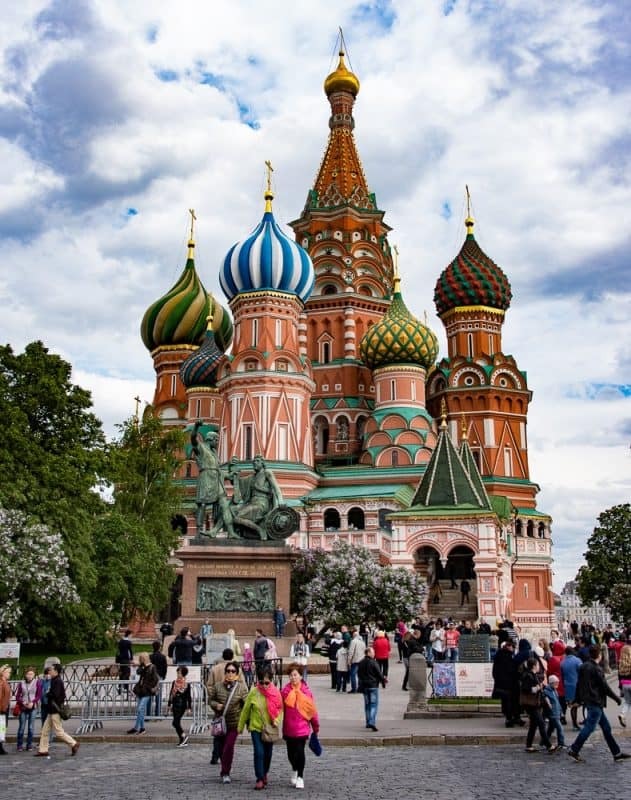 St. Basil’s Cathedral in Red Square takes on a whimsical flair with all its colors and intricate details. Red Square is named after the color of Communism. The Red Square, adjacent to the Kremlin, is the most prominent public space in all of Russia. This massive square at one time was a public market where merchants from around the world brought their goods to sell. It has been the site of festivals, parades, and protests. At one end of the Square is St. Basil’s Cathedral, without a doubt the most iconic shot of Russia with its onion-domed tops in a rainbow of colors, looking like something out of a fairytale. The square is also home to the State History Museum and Lenin’s Mausoleum and is flanked on one side by the opulent GUM department store. Not all of Moscow’s splendor lies above ground. Their metro stations are works of art, each having their own beautiful designs, some with chandeliers, stained glass, sculptures, ornate marble columns and intricate mosaics. You can hop on and off all day with one ticket, provided you don’t exit the metro. It was a bit of a feeding frenzy putting up with the public on the trains, but it was worth it to experience the magnificent architecture underground. 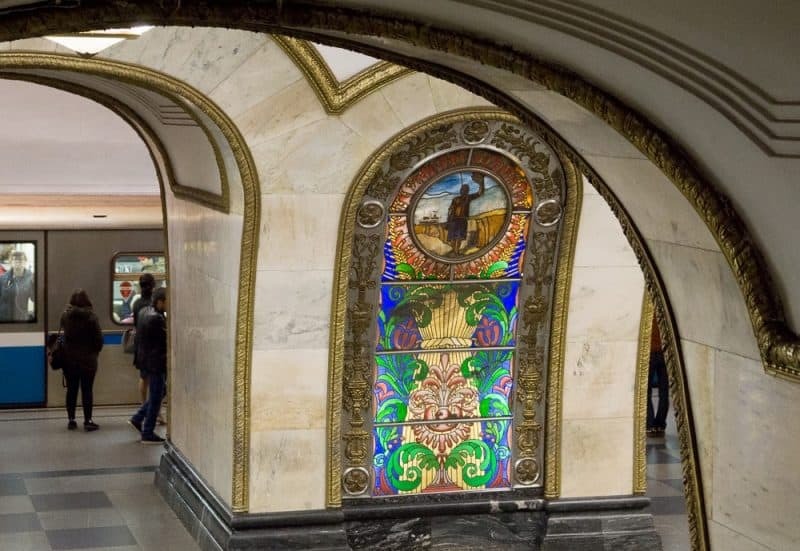 The beauty of Moscow’s metro stations, aside from the stunning artwork, such as the stained glass shown here, is the fact you don’t see any graffiti. Towering over the Moscow’s skyline are seven elaborate high rise buildings constructed under the orders of Josef Stalin in the late ’40s and ’50s after WWII. Known as the “seven sisters,” they were intended to outshine the skyscrapers that had gone up in the USA. Resembling a tiered wedding cake, they are all topped by a spire. 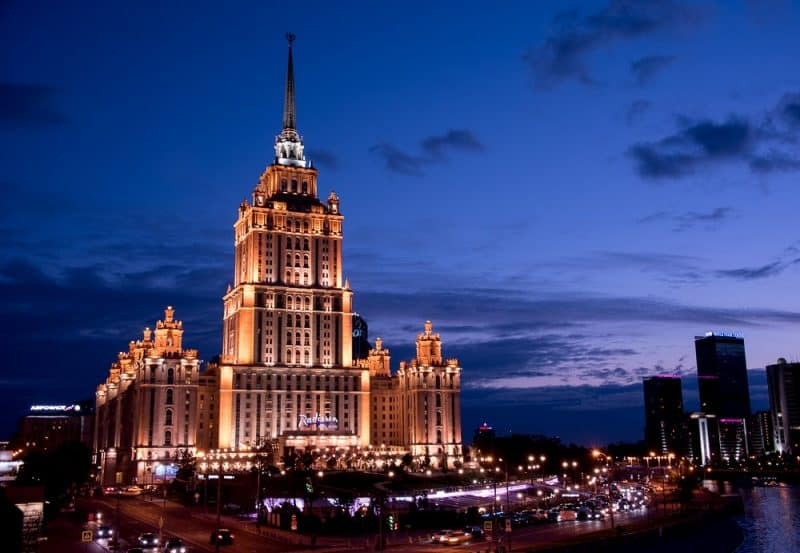 They include government and apartment buildings, Moscow State University and two hotels, including our Radisson Hotel. The Radisson deserves a shout out when the sun goes down. It appears as if every square inch of the building is illuminated with dazzling lights that light up the sky. 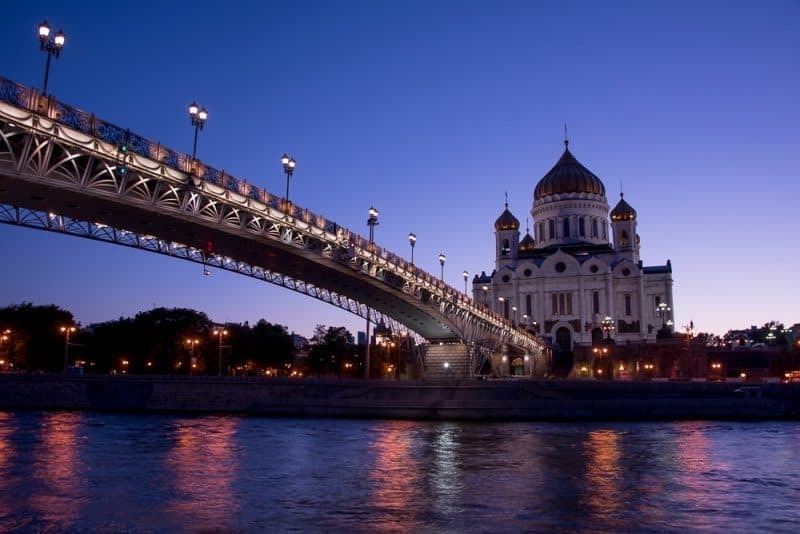 The Radisson offers scenic boat rides on the Moskva (Moscow) River. This property also has an observation deck reachable by three elevators and gives a 360-degree bird’s eye view of the city. When the sun goes down, the lights of the Radisson Royal Hotel light up the night sky as brilliantly as fireworks. The cost of electricity for this property must not be an issue! As photographers, this seemed like a win/win to photograph from the deck but we quickly learned that anything besides a cell phone or a small point and shoot camera wasn’t allowed. Bummer! Another gem that is photo worthy especially at dusk is Christ the Saviour Cathedral with its golden onion-domed tops. The Cathedral sits on the banks of the Moskva River and is the tallest Eastern Orthodox Church in the world. When the sun goes down, a series of beautiful street lamps turn on illuminating the ornate bridge that leads to the entrance of the Cathedral. Arbat Street, one of the oldest surviving streets in the city, is the one place we found in Moscow that is walkable. In historic times, this was the haunt of craftsmen and merchants. In the 18th century, nobility claimed the neighborhood for their own. 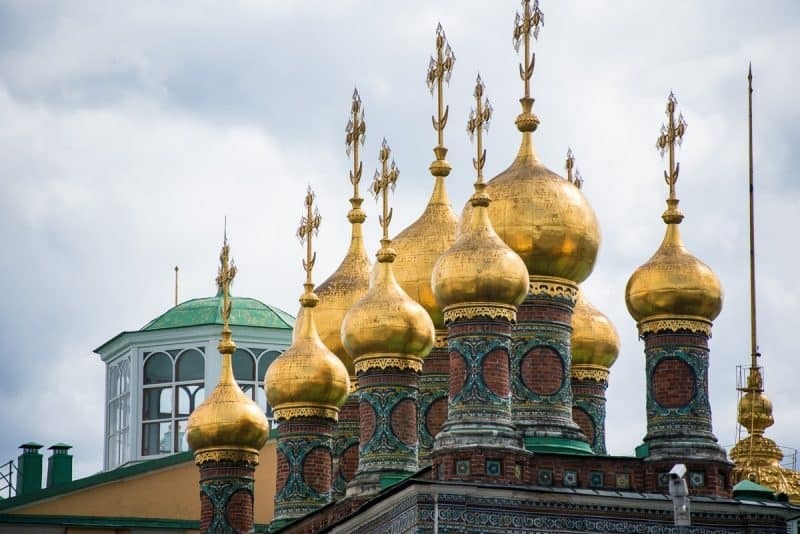 The ornate church domes found throughout Russia resemble a candle flame, that some believe is a flame of faith reaching up to the heavens. Today, the wide pedestrian boulevard is filled with eateries, souvenir shops, and bars. It’s a pleasant place to chill away from the traffic. The building facades, many in pastel colors, are lovely and yet another reminder of Moscow’s attractive side. Not to be missed is the Memorial Museum of Space Exploration. Standing front and center is a piercing titanium spire topped by a rocket at 328 ft. high. With the sun hitting this hunk of metal, sunglasses are a must. I was reminded of this site that Russian Yuri Gagarin gets the credit for the first manned space flight ever. Moscow is one of those cities that I’m thankful I got to explore, but once was enough. I felt the bad but saw the good. The wealth that Moscow flaunts was a major surprise, as was the overwhelming architectural beauty of the city. When I travel, I want to feel magically drawn into the essence of a place and her people, such that a return visit is a must. But Moscow wasn’t about to let me in, her heart and soul felt locked behind walls as thick as the Kremlin.